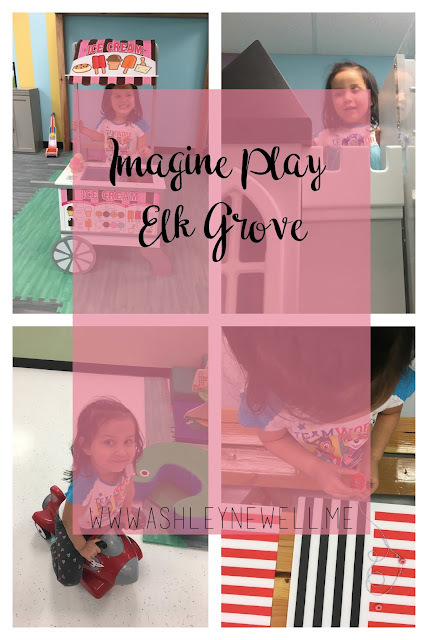 On October 22, Imagine Play open it's doors in Elk Grove. A local family wanted to create an indoor play place for imaginative play so they opened up Imagine Play. 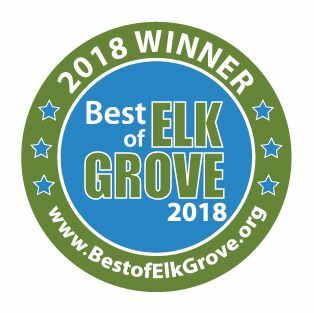 I've been excited for this place to open since Elk Grove doesn't have many indoor play places and I don't think any that cater to imaginative play. 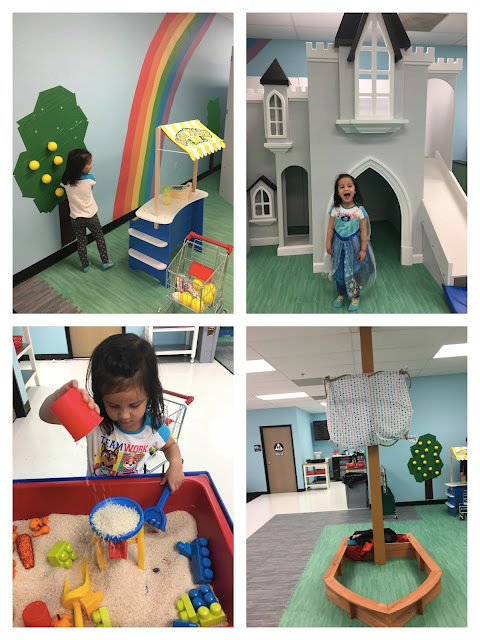 My littlest (almost 5 years old) is the queen of imaginative play so I was super excited to bring her to Imagine Play! We arrived at 10:30am last Thursday. It was a little hard to find since they don't have a big sign on the building yet. 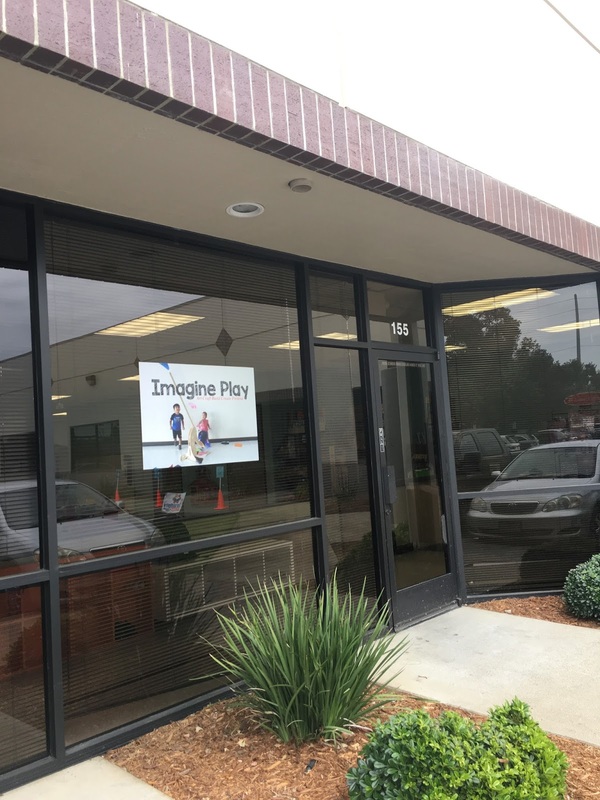 They have a large poster in the window with "Imagine Play" on it with a photo of kids playing. It is a few doors down from NewSongs School of Music which is right on the corner. You enter into a lobby area where you sign in by the door. There is a waiver you have to fill out before your children can play. You also leave your shoes in the front area which is great so you know people aren't tracking in dirt into the area where little ones crawl. You do need socks! If you don't have socks, you can purchase a pair for $2. I was a little weary when I walked in because the play area didn't seem that big to me. The whole space is about the size of your average boutique type store. Boy, was I wrong! I had to beg Avery to leave at 1:10pm because I didn't pack a lunch. We were there for almost 3 hours and she never got bored! She did ask me to play with her a couple times since there weren't other kids her age there all the time. I would suggest going with a friend so that your kid has someone to play with and you have someone to chat with while they play. ~ A bin for fishing. ~ A play "house" area with a table and chairs, kitchen, cleaning supplies (mop, broom, etc...), and there's even a painting on the wall that resembles a window looking out onto nature. ~ Dollhouse and train table. ~ A BIG castle with a slide and areas to go inside. They also have princess dresses hanging up that can be borrowed for dress up. ~ Pirate ship with dress up items and accessories. ~ Lemonade stand with a cute lemon tree on the wall where you can "pick" lemons. ~ A table with puzzles. ~ A board with learning magnets. One side has gears and the other side has shape magnets that can be used for building. ~ White board with PVC pipes to build courses to roll a ball. ~ Sensory table with rice. ~ Baby area with soft blocks to crawl on, toys, and ride ons. ~ Table with Little People toys. ~ Chalk cylinder for drawing. Every hour on the half, they have an activity hosted by the staff. The first one we just missed because we were filling out paper work was a fan with a tube on it that blew scarves around. We've seen similar activities at other discovery museums and it's always a hit. The second activity was a parachute. I'm bummed Avery didn't want to do it because I think it's SO fun! The third activity was making necklaces with candy, pretzels, and cereal. This was not only fun and edible, it helps with hand eye coordination and Avery even made a pattern! Lots of sneaky learning happening! Imagine Play also has a snack bar where you can purchase snacks, juice, and water. Everything is $1 plus tax. They have healthy options and treat options. 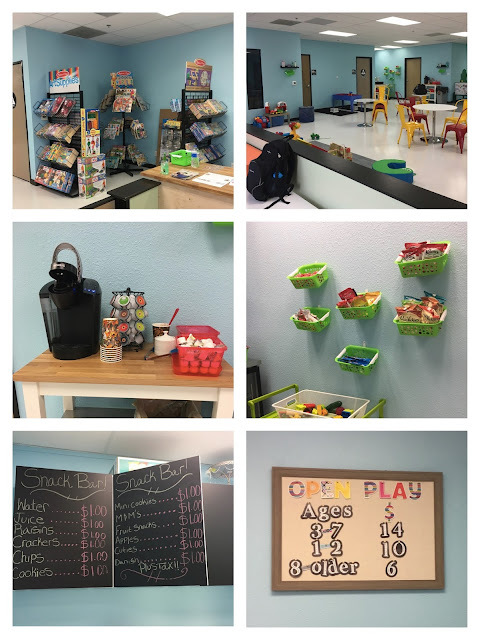 They have a COMPLIMENTARY coffee and tea selection for parents with a Keurig. There is a large sitting area with tables and chairs for parents to sit and chat or work. 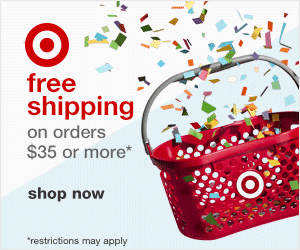 There is also an area where you can purchase Melissa and Doug toys. They have multiple restrooms. There are also party rooms for hosting birthday parties. Avery is almost 5 and I could see her loving this place for at least another year if not two years. 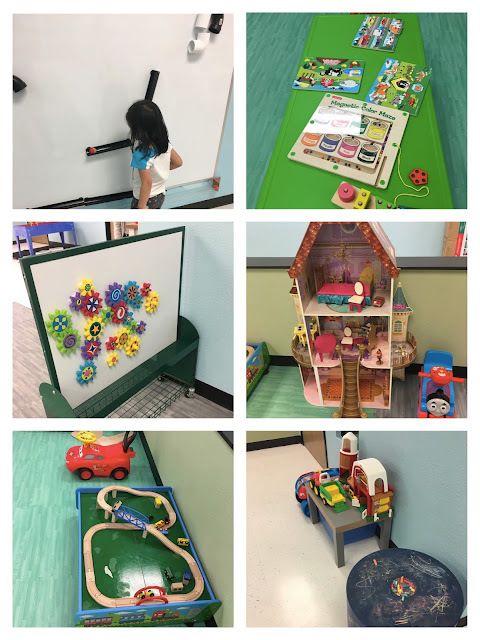 I would not bring my boys (ages 8 and 10) here because they would not be interested in these play stations and they would be SO big in the space since there's lots of darling toddlers walking around. 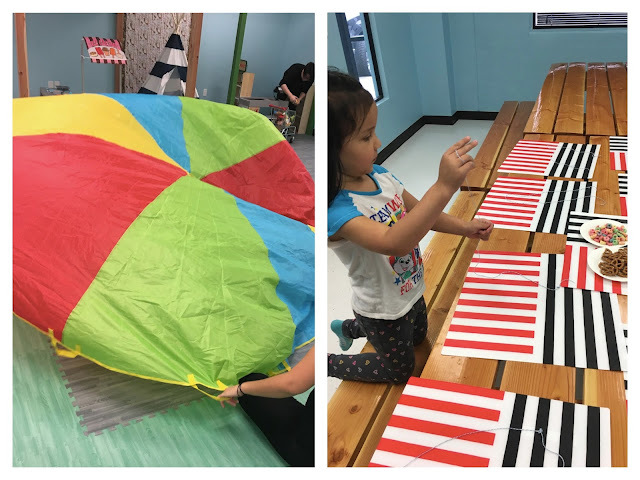 Imagine Play is perfect for toddlers and pre-school aged children! It's safe, clean, and everything is sized to fit a small child. While the price point might seem a little high, we did play for 2 hours and 40 minutes. She would have played longer if I had packed a lunch. For me, that amount of playing is well worth the $14 for the experiences she had! You can also buy membership deals and I've even seen Imagine Play on Groupon so look into those if you want to save some money. 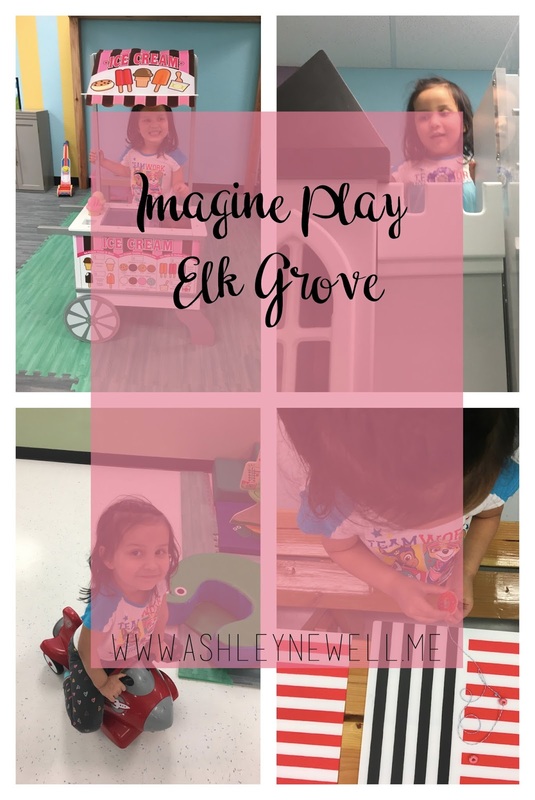 We can't wait to go back to Imagine Play! We had a great time! Next time I'll definitely bring a friend along for Avery and maybe I'll bring my computer to see if I could get work done while she plays for hours. And I'll pack a lunch. (Note: they are a nut free facility.) I will be hosting a giveaway for 2 free 1 day passes to Imagine Play on my AshleyNewell.me Instagram account very soon. Please follow me there if you're interested! Ah, that looks so fun! I wish they made places like this for adults! There is a place similar to this near our home. We love it. It is really wonderful to see our kids light up and use their imaginations. 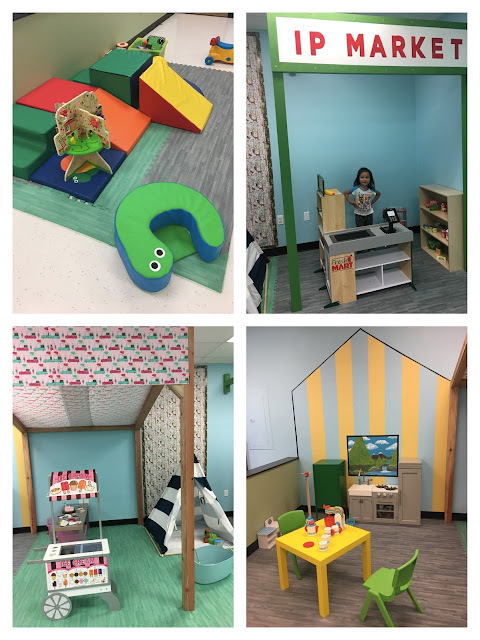 This looks like an awesome place to encourage imaginative play! This looks like a fun place! It seems like a great indoor activity when it’s rainy or too hot to be outside. Wow that looks like so much fun!! We love indoor play areas coming into the winter! It's like Sacramento has the most coolest places to bring your kid. Jealous!